When Tesla announced last fall that an updated Autopilot was set to roll out, company founder Elon Musk turned heads when he said new vehicles would be equipped with fully-autonomous hardware. The update’s here, but it’s being implemented with less-pizzazz and more caution; Tesla enthusiasts may be wondering what’s going on. Only a 45 mph max for Autosteer? Here’s what’s going on. But this is just the beginning for what Tesla refers to as Autopilot HW2 (short for, you guessed it, Hardware 2.0). So while the initial caution may seem strange for a company that rolled out it’s semi-autonomous features in a very hands-off manner, the Autopilot that Tesla enthusiasts have come to know will readjust in due time. Musk said as much over the weekend as HW2 cars began receiving the update. So here’s a quick rundown of what’s going on right now, and a recap of what’s in Autopilot. Tesla introduced the first generation of Autopilot in October 2015, and it relied on a single, forward-looking camera, a forward radar, 12 long-rage ultrasonic sensors, and an automatic electric-assist breaking system. The Autopark Summon feature allows a driver to scan for a parking space and parallel park on its own. Summon: Moves the vehicle out of a parking space. But Tesla says that features will be rolled out incrementally to HW2 vehicles as they’re validated by the company’s tests. Once everything is included in HW2 vehicles, the company says new features will be rolled out every few months. In October, the company announced an enhanced Autopilot was in the works. Musk said, in particular, the new hardware suite increased the number of cameras utilized by Autopilot from one to eight, three of which are forward-facing camera, providing 250 meters of range. Moreover, it now provides a 360-degree view of the car. At first, the cars features’ were, well, normal. The new Model S and X vehicles rolling off the line with minimal gadgetry. But that’s changed in recent weeks, when the first HW2 vehicles began receiving the new update. 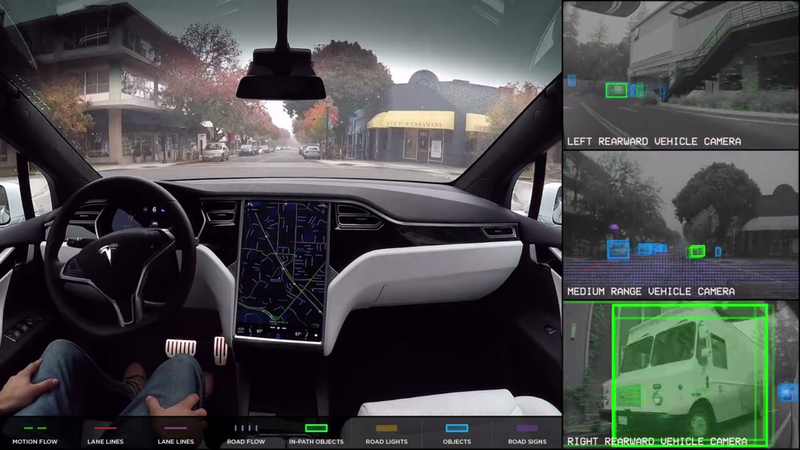 With the so-called Enhanced Autopilot, vehicles will be able to match speeds depending on traffic conditions, perform automatic lane changes without driver input, exit a freeway when arriving to a destination, and self-park. But the company warns—as have we!—that the driver remains responsible, reinforcing the importance of remaining attentive. Musk told a reporter from Bloomberg Business that within three-to-six months, the HW2 vehicles should have the suite of full self-driving capability features that noticeably departs from Enhanced Autopilot. What’ll that entail? Tesla says the cars will “ultimately take you from home to work and find a parking space for you on its own.” Of course, there’s a caveat: It can be used where it has been permitted by regulatory approval. The early features for HW2 vehicles include Speed Assist, which allows the car to read a speed limit sign; Blind Spot Warnings; and Auto Headlamp. And this past weekend, several more were introduced. Traffic-Aware Cruise Control (TACC) which is in beta testing, will allow a vehicle to adjust its speed based on where the vehicle directly in front of is situated. The initial HW2 rollout capped the TACC speed at 75 mph max. The Forward Collision Warning feature is enabled by default and designed to alert the vehicle when an object is within its path and could be hit without the driver intervening. When a situation looks dodgy, a chime sound is heard and the vehicle will appear in red on the instrument panel. Last, Low Speed Autosteer, also in beta testing, is what probably caught most Tesla owners by surprise. Utilizing TACC, Tesla says the Autosteer on HW2 vehicles is currently designed to be used to stay within a clearly-marked lane in a traffic jam. The company also notes that Autosteer isn’t useful in inclement weather, so, as stated above, drivers still need to pay attention. But, as we reported yesterday, Musk said the limit will increase as more data is collected by the company. It’s not a terribly surprising move. Tesla was at the center of the first fatal crash involving a semi-autonomous vehicle in 2016. Over the weekend, the National Highway Traffic Safety Administration cleared Tesla in the crash, but the company’s clearly striking a tone of caution, even as the regulator’s decision is seen as a victory for the future of autonomous vehicles. Moving into 2017, Tesla’s getting close to another intense goal set by Musk, a guy who’s known to set benchmarks that are routinely not met: Beyond full production of the Model 3, he want to send a Tesla on a fully-autonomous trip from Los Angeles to Manhattan. That alone should calm any concerns over whether Tesla’s 45 mph cap for Autosteer will be permanent.